When nothing else seemed to work, we used a variety of stickers (mostly Thomas the Tank Engine) to encourage our two year old during potty training. And while we didn’t do a lot of scientifically-based research, it seemed to have a positive effect. The question is does it really work? And, more specifically, can similar strategies be used to encourage long-term learning? The Time article highlights the work of Harvard economist Roland Fryer Jr. who distributed 6.3 million dollars of private funds to thousands of students in Washington, D.C., Dallas, New York and Chicago. something remarkable happened . . . Statistically speaking, it was as if those kids had spent three extra months in school, compared with their peers who did not get paid. It is equally important to reward students for achieving specific goals. 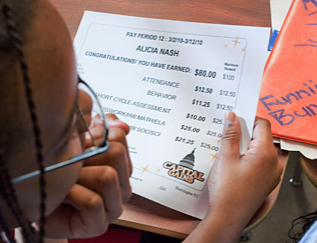 Though there are many ways to tell a student he or she has done well, recognition is most effective when it is abstract (e.g., praise) or symbolic (e.g., tokens such as coupons or stickers) and contingent on students’ attaining specific performance goals. (see Classroom Instruction That Works, pp. 73−74, for a list). Students [who were asked what they could do to earn more money on the next test] started thinking about test-taking strategies rather than salient inputs into the education production function or improving their general understanding of a subject area…. Not a single student mentioned reading the textbook, studying harder, completing their homework, or asking teachers or other adults about confusing topics. For me, it comes down to this. When all we worry about is test scores, about the short term, about meeting AYP, about meeting NVLB reqs, it seems as if paying kids for performance might be part of the answer. And I know that every school and situation is different and short term solutions may be what’s needed in some areas. But if we want to kids to think critically, to apply content in creative ways and to be true 21st century learners, I’m still not convinced. I saw this study and was also intrigue by the conversation it brings up about motivation. I don’t think money is the answer, not do I think we should assume children will want to learn for the love of learning. What I find interesting though, and what you alluded to, is that while most teachers disagree with paying students to get good grades, they often teach in an exact way that would work nicely for paying grades. That’s because of End of Course exams that administrations focus on, and thus teachers. If we actually taught in a manner that allowed students to discover a love of learning, I doubt there would be a need to pay for grades. Teachers feel forced into teaching in a 19th century model to get kids to pass the test, which will never create a “love of learning.” So I would tell teachers, if you really object to paying for grades, then teach more creatively. Find a way to teach the standards, but creatively. It exists.